VOL. I NO. 2 DELHI, THURSDAY SEPTEMBER 24, 1942. New York - "How's your girdle, Myrtle? That has become the national slogan of the WAACs, according to word received from seven of the gals who have just returned here from eight weeks training to be Army auxiliaries at Des Moines. "You see," said Linda Barnes, "they issue underwear just like on an assembly line. You go in one booth and try on a girdle, go in another and try on something else. Pretty soon you come out all outfitted." The girls also said that the Army auxiliary camp was the scene of a few decidedly unlady-like brawls. We learned considerable about being soldiers the girls said. Because of lack of paper and other considerations the Roundup is being printed on the basis of 50 percent circulation. In other words if there are 100 men in your barracks you should get about 50 copies. Circulation is handled by the S.O.S. with Capt. 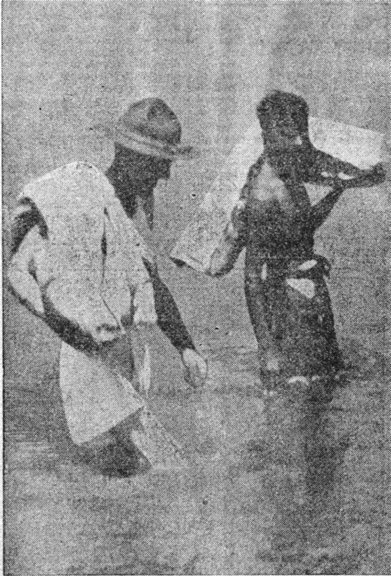 V. Slater doing the spade work. He gets his copies every Thursday at 9 a.m. and it's no small job sorting, dividing, wrapping and mailing to every station and organization in the theater. Lt. Col. Samuel T. Moore, old time publicity man, bon vivant and after dinner speaker extraordinary, has been worried about the lack of a Hindustani drinking toast. "AHPKO BAHUT TUNDEROOSTRI OR ISHK!" It means "To you, plenty of health and love." Sam intends to copyright it and furnish each user with an Indian to pronounce it after the third drink. "That would wow the boys in the backroom on Saturday nights at home," Sam observed. In New York City it's "shirts by Sulka." On the West Coast "suits from Phelps-Terkel" lend a certain amount of distinction, but in this theater it's going to be "clothes by the S.O.S.," the poor man's Hart Schaffner and Marx! A long time ago Maj. Gen. R. A. Wheeler, the S.O.S. 's big boss, conceived the idea that a lot of vital shipping space could be saved by manufacturing clothing for our troops here in India. He summoned Lt. W. A. Thomason, who graduated B.S. in Textiles from North Carolina Stat and took his "Masters" at the Philadelphia Quartermaster depot. General Wheeler, being broadminded decided to overlook the Philadelphia Depot famous for the circus tent drape, for making blouses that looked like inverted zoot suits and that offered the freedom of the old-fashioned straight jacket. He told young Thomason to go ahead and make plans for clothing manufacture. Everybody said it couldn't be done, of course. There was the question of Indian labor, the great range of American sizes, the new methods of workmanship required, the U.S. specifications, weaves, weights and special finishes not familiar to this country. Thomason promptly scouted around for some help and picked up Sgt. William J. Gilmore, for seven years in the textile business back home. The two of them went to work and were able to report that their first Indian-made American-style uniforms will be ready for delivery in about six weeks. One of the problems encountered was that of shirt sizes. America has 34 while here in India they make seven. A compromise of 21 sizes was reached. All other problems have now been solved with the exception of zippers for field jackets. These will undoubtedly have to be imported. According to Thomason "the general standard of the clothing will be about the same as our own." staff and make you prove it. He is looking for ideas and if he can't find them, the Roundup won't be quite what we want it to be - the most readable sheet in the Far East. This is a good chance for me to say to all of you that I am proud to have such a gang to work with. I know what you all want - some action - and I am doing my best to make it come out that way. Meanwhile, we've got to have patience and continue to build up what you have already started so well now - a reputation for efficiency, energy, and good behavior. Remember that we are not at home; we are guests in foreign lands, among people whose customs and traditions are radically different from ours but not, for that reason, necessarily wrong. We can learn a lot from them. We must all remember that we are constantly under observation as representatives of the United States of America and it should be our ambition to leave behind us the impression that we have lived up to what is expected from us in that capacity, both by our Allies and our own people. I know you'll do it. Best of luck, and a good send-off for the Roundup. All copy must be in by Monday night for the following Thursday's paper. All pictures must be in by Sunday night for the following Thursday's paper. Include your own full name and rank with your copy and pictures. Use full names, grades and ranks in your stories and picture captions. The Roundup may be mailed home as precensored matter, according to word received from Lt. Col. E. E. White, theater postal officer. This paper has been precensored and approved by G-2 thereby complying with regulations as outlined by White. You should put the paper in a sealed envelope in order that it will pass free as first class mail. Lieut. Walter E. Hance, 31, commissioned from the ranks only a few weeks ago, was buried with full military honors in New Delhi, Monday. "His death was accidental," was the report of military authorities. Hance, who leaves a wife and one small son at Hamilton Field, California, had served in the Army for 12 years. He had been promoted from Master Sergeant to First Lieutenant in Ordnance. Troops in this theater may send Christmas packages home without reference to numbers or size, but there will be no exemption of import duties, according to a recent radio from the War Department. The radio states that the Treasury Department would "not grant exemption from the payment of duties" which run from about 35 percent to 110 percent, on some kinds of jewelry. 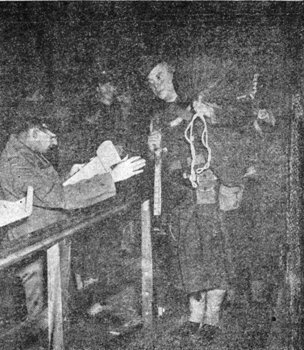 Word from Lt. Col. E. E. White, theater postal officer, indicated that War Department restrictions as to size and frequency of parcels does not apply to parcels from overseas troops to the U.S.
"In order to insure getting your packages home by Christmas they should be mailed by October 1," White said. "Substantial packing is necessary and parcels should be registered and insured." A few examples of duty charged follow: On ivory, generally 35 percent; embroidered rayon and wool, 90 percent; embroidered cotton and silk, 75 percent, while jewelry ranges from 65-110 percent. An all-American hospital for the U.S. Armed Forces opened its doors in New Delhi recently. Today the hospital, still on a semi-temporary basis, is caring for 43 cases of Delhi belly, influenza, general debility and other soldiers' ailments. Major Allan McClellan, the C.O., is preparing to accommodate 100 patients. 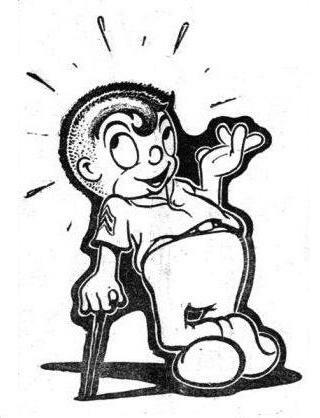 On May 1, 1942, the group was activated somewhere in southeastern America. 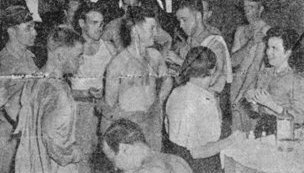 On the 28th of May training was completed and seven officers, six nurses and 42 medical department enlisted men were on their way to India. In the meantime, in New Delhi, Indian laborers were putting together the long, low buildings which were to house the organization when they arrived. Iron hospital beds, refrigerators, operating tables, G.I. pajamas and other equipment necessary for a hospital were brought over from home. When the advance party under Major McClellan arrived September 10, all they had to do was to make the beds and go to work. This September morning a special correspondent of the Roundup made a tour of the hospital with the major, who by the way, describes himself as a former "country doctor" from Caspar, Wyoming. The major has had plenty of experience in surgery, having been medical director of an airline based at Caspar for some years. He knows his Allies, too. He took time off in 1934 to do a course in industrial surgery at Edinburgh and Glasgow. The staff has plenty to do. The building is not yet completed. The air conditioner is still in the making, and the present operating room is only temporary until the air conditioner is ready. Lieutenant D. L. Clawson, the supply and mess officer, was counting sheets and G.I. pajamas when we arrived. In another room 1st Lieutenant F. S. Sammons, a big, blonde dental officer from Chicago, was opening crates. He stopped long enough to tell us he expected to be pulling teeth in a week when the rest of his equipment arrives. Sgt. Edward B. Goode, of Rio Hondo, Texas, an X-Ray technician, was in another room setting up an X-Ray machine. A field unit X-Ray was tucked away in a corner of the room to be used if there is a power failure. There was only one man in the screened contagion ward. He was recovering from diphtheria. Chief nurse, Lieutenant Anne Miser, had her pretty head bent over a deskful of files and papers in a room just off the main wards. She said her job was "to keep the others busy," which job seemed to be taking up most of her time. In the main ward Pfc. 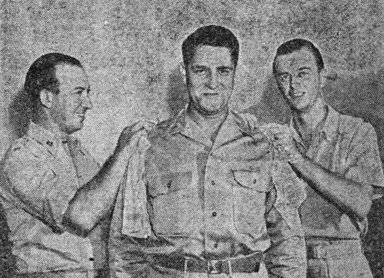 Troy Mayne, of Lowell, N.C., was dressing the wounds - barbers' itch - on the chin of a wincing corporal. Lieutenant Carl S. Ulicny, ward surgeon from Salem, Ohio, wandered among the reclining patients. At the back of the ward there were magazines and books for those able to sit up. Two sergeants were working over a small stove in the kitchen when the Major led us in to see where the special diets are concocted. A campfire in the yard outside the kitchen is doing supplementary duty boiling water until a service range arrives from home. The food goes across the hall to a neat little dining room, where the walking patients eat in shifts. The dominating piece of equipment in the kitchen and dining room are two huge refrigerators, into which Sergeant Charles W. Rose, of Brunswick, Maryland, was peering hungrily when we turned up (and ruined his pitch). We met the Adjutant, Lieutenant William E. Kennedy, of Somers, Iowa, in the laboratory, where Pfc. Frank Fales, of San Francisco, had his eye pressed to a microscope. Major McClellan said he could take up to 100 men without expanding the present facilities. But he doesn't expect to stand still. The American War Correspondents gave a dinner last week in honor of the birth of the Roundup. 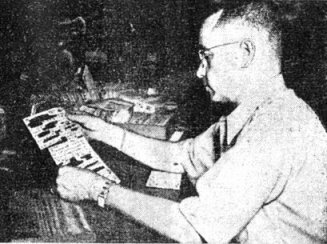 The three members of the paper staff (photographer, artist, and editor) were present as was Lt. Col. R. B. Pape, G-2 and military censor for India, and Lt. Col. Samuel T. Moore, Public relations Officer for the 10th Air Force. It was a little doubtful which correspondent acted as master of ceremonies. On the basis of time spent on their feet it was probably a dead heat between Sonia Tamara, New York Herald-Tribune; Bill Chaplin, International News Service, and Darrell Berrigan, United Press. Close behind were Preston Glover, Associated Press, and Archie Steele, Chicago Daily News, who between them proposed 259 toasts to Boise, Idaho. Herbert Matthews, New York Times, told of his days in Rome during the early part of the war. Bill Fisher, Time and Life, talked about India, and Bill McGaffin, Associated Press and president of the newly formed War Correspondent's Association, just talked. Col. Moore spoke on "A Home for Unmarried Fathers." YOU SEE?!! - This is what happens when you try to fox the old censor. This guy is getting in practice for a career cutting out paper dolls. The character is Capt. Elmer G. Wallen, the base censor, and the photo was shot by T/4 Stephen Palinkas just in case you'd like to slaughter HIS mail sometime, captain. Recent activities of the United States Air Force planes against enemy installations in Burma and Yunnan were reported by the 10th Air Force this week. On September 17th a medium bomber machine-gunned the town of Bhamo. A large river steamer southwest of the town was bombed. Another medium bomber machine-gunned and bombed an oil barge north of Katha. The railway junction west of Katha was bombed and a section of the tracks was destroyed. Several barracks at Katha were bombed and damaged. On September 18th the airfield at Tinka and the former Chinese airplane factory buildings at Loiwing were attacked by medium bombers. Demolition bombs fell on the runway and two buildings, each 300 feet in length, were destroyed. Trucks between Tinka and Loiwing containing enemy soldiers were bombed from low altitude. Enemy barracks at Namkhan also were bombed. Two barges and a steamer at Katha were attacked, and on the river 20 miles south of the town, four barges and a steamer were strafed. We're up against a hitch. After countless adventures, growling, grouching, grumbling and generally griping Corporal (formerly private) Gee Eye has returned to the fold. 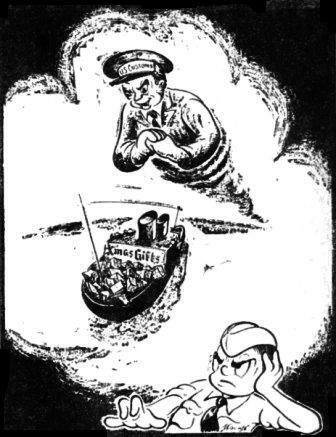 Gee Eye is the lad who looked out from the Brazil bulletin board every day offering his unusually impertinent observations on what went on aboard ship. He was almost constantly in a stew and he finally talked his C.O., T/5 Jack Nolan, into making him a corporal. On the Brazil he crabbed about everything from the "trots" to the over sufficiency of hard boiled eggs. His comments on the latter caused him to be censored for the duration of the voyage. His hair grew longer and longer and he got madder and madder because he couldn't get it cut. Now he is back a corporal and with a regulation "G.I." haircut, but he's same old sour puss and we'll be seeing him every Thursday. GET YOUR HAND OUT OF THERE - That's what the snake charmer is telling the lad, whose name we don't have, as he tries to chuck the friendly little cobra under the chin. COLONELS AT PLAY - Even colonels have their moments as witness the above. On the left is Col. Robert P. Williams, theater surgeon; grinning like the cat who swallowed the canary is Col. C. C. Fenn, Judge Advocate for the theater; while on the right, wearing the modest upper is, we believe, Col. R. A. Osmun. Don't recognize the gent with his back turned to the camera. VETERAN GOING HOME - Mr. Sgt. Frank A. Marek, being wheeled by Lt. Ethel M. Burkholder, is being returned to the States for physical disability following his duties in Rangoon and on the Burma Road. He went over the road with the first American convoy and worked with the American demolition squad in Rangoon. The 10th Air Force Band gave its first audition at the Marina Hotel recently. The band has only been assembled for a few weeks but has progressed very rapidly due to the excellent supervision of Sergeant Hackney and Private Merenda of the 10th Air Force, who in turn say that with the exceptionally good talent on hand the band will be something that the American troops will speak of with pride in the near future. The band's opening at the Marina Hotel was a call to all available talent such as vocalists, dancers, impersonators, etc., and indeed it furnished an interesting array. Arrangements are underway for frequent "jam sessions" in the future, the dates and places to be announced at a later date. BEHOLD THE KING - Neptunis Rex really came into his own on the Brazil when the ship crossed the Equator. Neophytes were hosed down and eggs were thrown. MORE TROOPS than you can count on your fingers and toes boarded the Good Ship Brazil at an Atlantic port a long time ago. 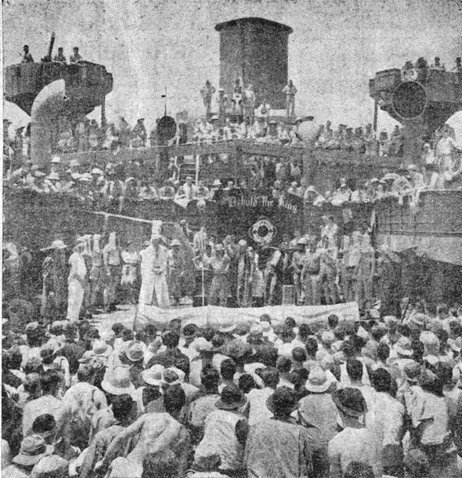 Later the ship docked in India. WHAT, NO DHOBIES? 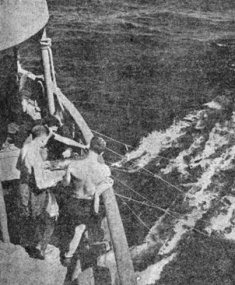 - There being no dhobies nor rocks to beat clothes on, the boys did their laundry by towing it behind the ship. Quite a wake! IT WAS A COZY VOYAGE what with the portholes always closed at night and plenty of room to stretch in. This was on the second night. Thumbs are still up. THE PUNCTURE SQUAD worked overtime all the way across. The nurses were lovely indeed but needle jabbing is no aide to romance. 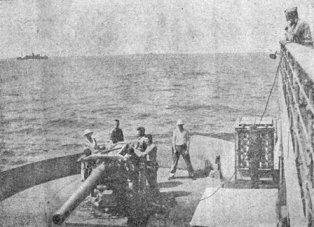 GUNNERY PRACTICE - The grim side of the voyage came when the gunnery crews would unlimber their weapons and cut loose with target practice. In the distance can be seen another vessel in the convoy. No chances were taken - All U.S.A. Signal Corps photos. UNCLE JOE STILWELL brings home the biscuits! 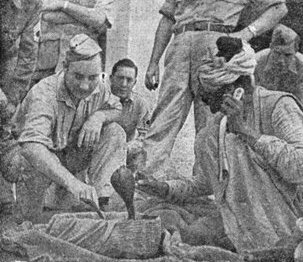 During the trek out of Burma the R.A.F. 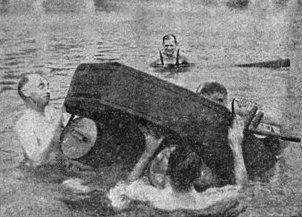 dropped biscuits and bully beef for Lt. General Stilwell and his party as they floated down the Uyu River on a raft. The general (Uncle Joe to his men) was one of the first over the side and carried back his own bag like all the rest. Disappointment - Private Martin Quigley thinks that India isn't such a bad place. "There's only one thing wrong with it," he says, "I haven't seen a Jap yet - and, damnit, I came here to fight the Japs." Sgt. V. Clowe is under a handicap this month. He burned an old wallet and forgot to check its contents thoroughly. When only cinders remained he remembered that there were Rs. 150 left in a zipper pocket of said wallet. Recommended - S/Sgt. "Bill" Olmstead is hereby recommended to the editor as motion picture critic. (Got one.-Ed.) He proudly claims that he hasn't missed going to the movies on any night except for the time he was in the hospital. Speaking of hospitals, we hear that S/Sgt. "Whitey" Brasher is in our new American Hospital - malaria. Corp. Roy Meyers has also just been taken there. Get well quickly, boys, so that you will be able to introduce us to the nurses soon. Yokel Boy Makes Good - Pvt. Donald L. Poper's hat is becoming a trifle too small for him these days. The Norristown Times Herald (Pa.) printed his picture with a big build-up and he just received a letter from a girl who pleaded for his autograph. "It's only the beginning, boys," he boasts. "You see, I haven't Gable's big ears." Rah, rah! - Pfc. Fensom, captain of the G Bay "Giants" was elated at the pitching performance of Pfc. Norman Epstein (known as Ming Toy) in the last softball game. Sgt. Hupfer's brilliant fielding also came in for commendation. Both players were solemnly promised their first Varsity letter this season. Until now, the rumor had been that they were only to get numerals, which would have been "Duration and Six Months" embroidered on a burlap bag with armholes. Dog Tag Substitute - We have been reliably informed that the American soldier in India is very easily identified as a Yank. The test is to look at his hands and check as to whether he is wearing a star sapphire. Fashion Note - S/Sgt. Edwin Davis will inform you, should you inquire about the red marks around his lips, that he has neither taken to wearing lipstick nor has he just kissed one of the fair maidens around town. He will protest that his lips are just sore from constant practice on the trumpet - That's no fun, Sgt. Ping Pong parade - As the ping pong tournament passes the half-way mark only six contestants remain in the winners bracket. Sgt. Malinas, Leight Webeler, D'Orange, Corp. Supman and Pvt. Sagerman are the ones who are coming down the home stretch, with Webeler holding a slight lead on Sunday. THREE SHRINKING VIOLETS - were made Warrant officer Junior Grade the other day. 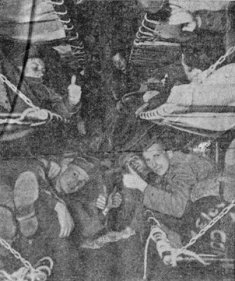 Left to right above are George B. Stewart, Francis Grove and Fred B. Clippinger. They're all "mister" now and pulling their rank on everybody in the SOS. - T/4 Stephen Palinkas photo. Three of S.O.S. best in New Delhi, got bounced up to Warrant Officer, junior grade recently. The men are former M/Sgt. George B. Stewart, Whitehall, N.Y., M/Sgt. Fred B. Clippinger, Shippensburg, Pa., and T/Sgt. Francis Grove, Carmel, N.Y. The appointments were made by Major General R. A. Wheeler, commanding the Service of Supply, at Gurdwara Road barracks, New Delhi, India. All three men are outstanding in their respective departments. George B. Stewart, now Mister Stewart, is 26, and has been in the Army since February 29, 1940. Stewart said, "I was either hold up the tradition of leap year and take a wife, or adding himself to the Army's defense and expansion program." The latter, according to the recipient of the Service's highest enlisted rank, was least confining, and from which one could get a discharge without alimony. Stewart came to his rank by way of West Point, where he received special training in Ordnance work. Clippinger, chief clerk, A.G.D., has over nine years service, a goodly part of which was served at Scoffield Barracks, Hawaii. This W.O. 's composure is unruffled and still answers to Corporal or Sgt. from force of habit. Former T/Sgt. Grove, transportation, S.O.S., hailing from Carmel, N.Y., is sporting his crossbar in good fashion, still directing a smoothly running transportation dept. All Departments represented by shiny new Cross Bars are in good order, though slightly beclouded by smoke of many high priced cigars. 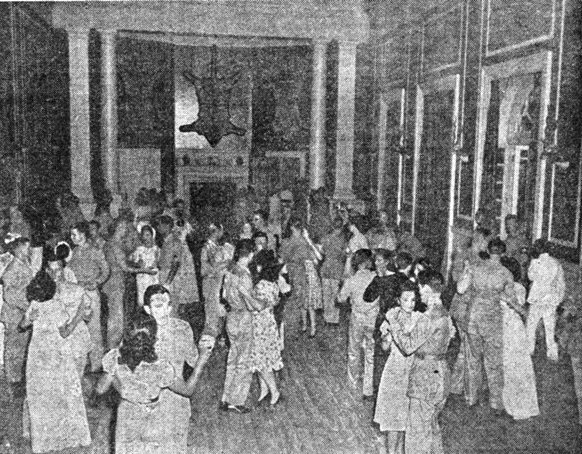 RAJA JIVE - Raja Bikner turned his palace over to our enlisted men for a dance which probably marked the first time in history that Americans jitter-bugged on an Indian potentate's floor. A quick search of the barracks was made for tiger skins the next day, but the boys apparently resisted temptation. The gent all wrapped up in his work is S/Sgt. 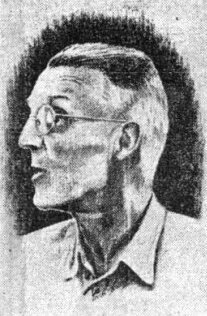 Stan J. Bajek. - Sgt. William F. Cox photo. We're all going broke and every pirate selling Kashmir woolens, Kashmir silks, Persian rugs, star sapphires, jade and all the rest of it will retire as rajas as soon as the American contingent goes home. We're getting hooked for about three prices on everything we buy. Each of us individually, of course, is fully aware that he is getting the best of every merchant he deals with. Doesn't the merchant whisper, "please, mahster, don't tell the price I sell to you. I sell at no profit because you are my friend, not my customer." That is very good for the ego, of which we have our share, so we swell up and never permit ourselves to find out that what we paid 75 rupees for could probably have been bought for 25 and was worth 15. We don't mind, however. It's all part of the game. We love to sit down with these shrewd old merchants and bargain with them and most of us are enchanted by the beautiful Chinese, Persian and Indian wares that we buy. We don't care if we are paying three prices, because we are sending the things home to our families, wives, sweethearts, etc., and what the hell. Christmas, however, is just around the corner (by sea) and we all want to send Christmas boxes home, but the Treasury Department says if effect, "we don't care what you send home, but the people that get your presents must pay duty at the rate of 35 percent to 110 percent for the privilege." We'll look sort of silly to our girlfriends if they get the jade bracelets we send them with Treasury due bills for 15 dollars each attached. Our Mothers won't mind it, but we will, when they have to pay duty to get those Kashmir shawls to hang on the Christmas trees. If we were a big metropolitan paper at home we'd tell all you subscribers to write or wire your congressman and we'd tell our Washington representative to go in and raise hell with Henry Morgenthau, but all we can do is hope Henry hears about this some way and makes a change.